Tomorrow, Monday December 16th, we are celebrating our 7th Day of Christmas! With that comes another SPECIAL OFFER that you will not want to miss out on. Our staff pick for the 7th day is BOTOX! Mallory Stahl, our managing esthetician, chose this treatment as her very favorite. Get 10% off your entire Botox purchase when you call Monday, December 16th and book your appointment between now and the end of the year. Dr.Kjar, board certified plastic surgeon, administers the injections. If you aren’t sure if you are a candidate for Botox, book a complimentary cosmetic consultation to discuss your options with Dr.Kjar. Also, start receiving REWARDS each time you get Botox. Join our Brilliant Distinctions program and you will receive coupons for money off each treatment. You can register for that here. 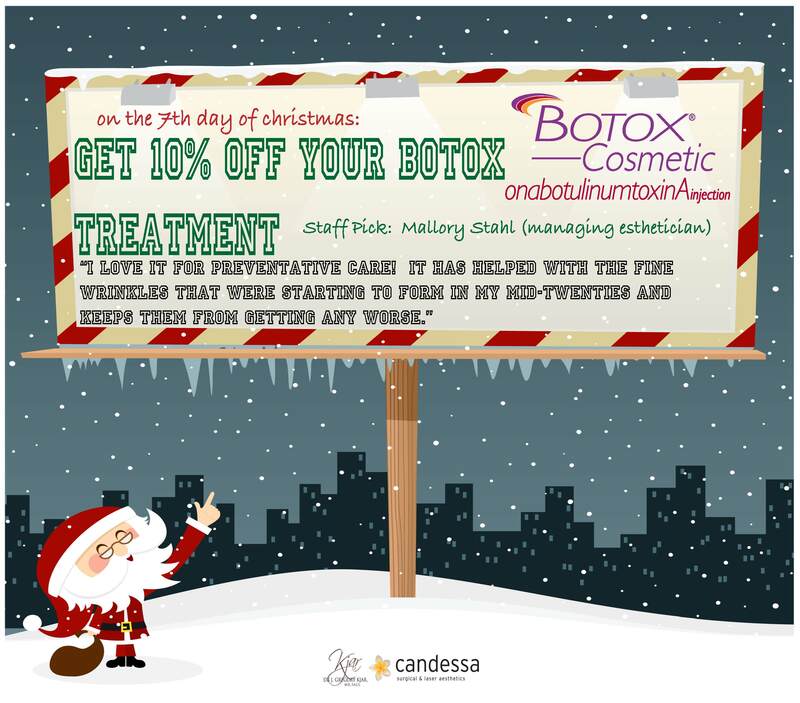 4th Day of Christmas - Special Offer! 9th Day of Christmas - Special Offer!